Awareness is important, but cancer prevention is absolutely vital. February is National Cancer Prevention Month, the perfect time to focus efforts to stop cancer before it starts. Cancer is a complicated disease. One often feels helpless when faced with a cancer diagnosis, this month the focus is placed on action and empowerment. Cancer Prevention research continues to advance, and it is now believed that more than half of all cancers diagnosed in the United States can be attributed to preventable causes. Most preventative measures are things associated with an overall healthy lifestyle. Quit Using Tobacco Immediately ~ This includes smoking and chewing it. For those that don’t use it, DON’T START! Be Active ~ Regular, moderate to vigorous exercise every day. But even a minimal increase in activity can be helpful. Eat Healthy ~ Finding accurate information in this area can be daunting but limiting sugars, processed foods, and alcohol while making most of the plate vegetables, whole grains, and lean proteins will be a good start. Limit Sun and UV Exposure ~ Make sunscreen part of your daily routine and take measures to cover yourself during extended time in the sun. DO NOT use tanning beds. Routine Screening ~ These vary for age groups, genders, and family history. An outline can be found here. The efficacy of a healthy lifestyle toward cancer prevention (and an all around positive impact on quality of life) is substantial. But the newest research is focusing on immunotherapy and vaccinations. The introduction and routine use of the Human Papillomavirus (HPV) vaccination has opened a very promising door for cancer prevention. Patients can count on us to stay up to date on all research. We will continue to support efforts to stop cancer before it starts, during National Cancer Prevention Month and all year long. 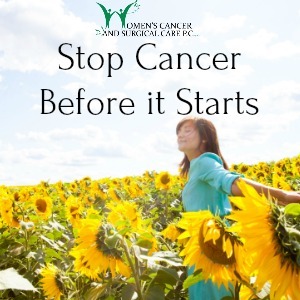 This entry was posted in General, Genetic Testing, Hematology-Oncology and Cancer Genetics, Prevention & Screening, WCSC Latest Highlights and tagged cancer prevention, healthy living, prevent cancer, stop cancer.